Sorry I have been a bit quiet recently. If you follow me on Instagram you will have seen I made a wedding cake a few weeks ago. I had to make it in 35c heat which was challenging. Especially when you are trying to make flowers out of sugar paste! I will do a separate post about it soon, but I needed a bit of a break from baking after than cake! I am now back and have a few posts lined up. The first one is this strawberry summer cake. As I mentioned in a previous post, there is a large strawberry field just outside our village so I was using them as much as possible! 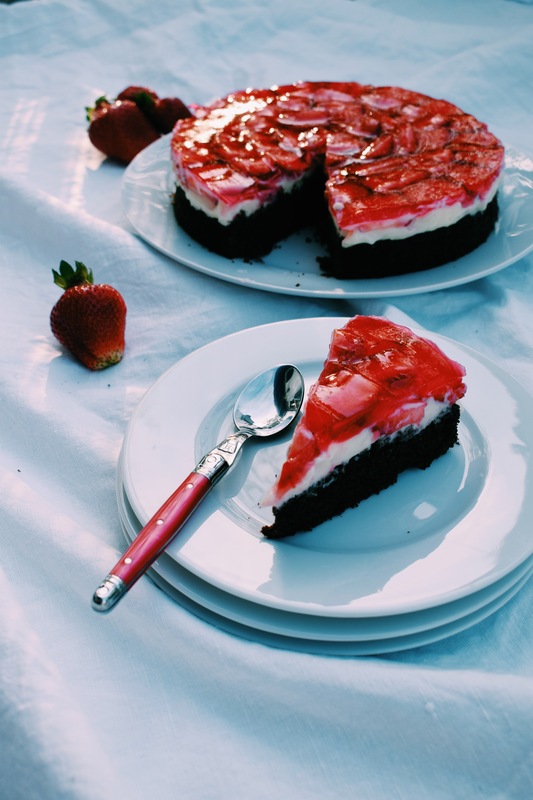 This is actually a really simple recipe, a soft chocolate sponge, topped with a white chocolate cheesecake mixture, sliced strawberries and red gelatin or jelly! This is a really nice summertime treat! Preheat the oven to 170c and grease and. Line a 20cm cake tin. Sieve the rest of the dry ingredients for the cake into the mixture and stir until just combined. Finally, add the milk and mix until you have a smooth consistency. Place into the prepared cake tin and bake in the preheated oven for 30 minutes or until a skewer inserted into the middle comes out clean. Once baked, allow to cool in the tin for 5 minutes before turning out onto a wire rack to cool completely. Once the cake is completely cooled. Grease and line the sides of the cake tin. Level the cake and place in the bottom of the freshly lined tin. Prepare the cheesecake topping by melting the white chocolate, put to one side to cool. Meanwhile, beat the cream cheese and icing sugar together until light and fluffy. Then spoon the mixture onto the top of the cake. Using the back of a spoon smooth the cheesecake mixture over the top and make it as smooth as possible. Next, arrange your prepared strawberries on top of the cheesecake mixture. Finally, prepare your gelatine or jelly according to the instructions on the packet. Once ready, spoon over the top of the strawberries until everything is covered. The gelatine layer is only supposed to be a thin layer to seal everything together. If you have any leftover jelly you can pour it on top and just have a thick layer of jelly or you could pour it into a small dish with a few strawberries. Place in the fridge for at least 3 hours to set or ideally overnight.